Every Friday for the past three weeks millions of students around the world has been skipping school. The reason for this global tsunami of civil disobedience is not that the youth lack the will to learn about the world around them. In fact, it is the exact opposite. The reason class sizes around the world have been shrinking each Friday is the awareness these students have that humans are irreversibly changing the climate and jeopardizing their future. The international mass mobilization of youth began in Sweden led by a 16-year-old environmentalist named Greta Thunberg and a handful of students that had enough with world leaders doing little to nothing to protect the planet from climate change and environmental destruction. On Friday, March 22 thanks to a nine-year-old climate activist and Hermon Public School student Brynn Kilpatrick the climate strike has now come to Bancroft. While in the first week only a small group of strikers assembled at the intersection of Hwy 62 and Station Street in Bancroft, just one week later the group’s numbers have grown by more than 20 people. Holding a sign she made that read “Why Study for a Future that Doesn’t Exist,” Brynn explained why she cut class to raise awareness about climate change. Rather than letting her fear transform into apathy, Brynn became inspired by Thunberg’s climate strike – aka #Fridays4Future – and decided to start a strike of her own. With plans to continue her campaign for the rest of the school year every Friday from 11:30 a.m. until 3 p.m., she is encouraging other students in the Bancroft area to come out and support the strike and help send a message to the powers-that-be. In hopes of getting more of her classmates involved, every day when her class sits down for “circle time,” Brynn has been using the opportunity to share why she is not in class on Fridays. She plans to show her fellow students the same video by Greta Thunberg that inspired her to take a stand. “If you think school is more important than climate change, you’re not going to have a good future,” Brynn said. Pointing out that climate change affects everyone’s future, Brynn said she hopes that people of all ages will join her campaign for a healthy planet. 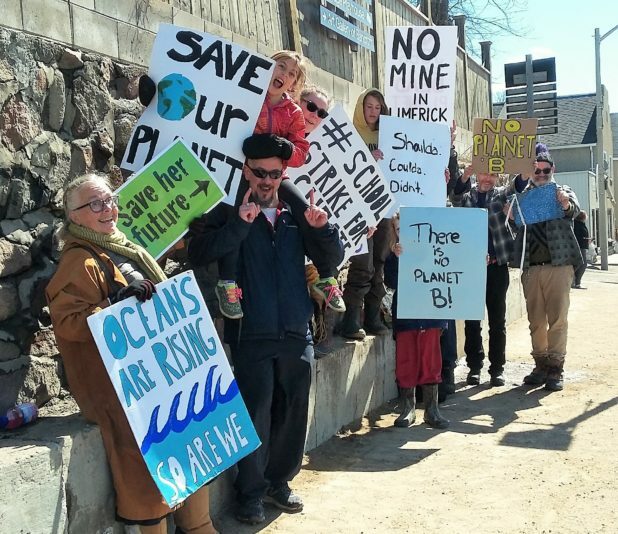 Chuck Potter was just one of several strikers gathered in Bancroft last Friday with decades of experience defending the environment. Motivated to join the strike by Brynn’s courage and passion, he decided to bring a sign which read “No Jobs on a Dead Planet,” that he has used in his efforts to fight the proposed mine in Limerick and the quarry in Faraday. Potter said the only way to ensure future generations inherit a healthy planet is if everyone works together. “It’s going to take an effort from everybody, but it is going to lead to a much better life if we all do it together,” said Potter. Highlighting advancements in renewable energy, sustainable building, organic agriculture and other green technologies, Potter said there is no shortage of solutions available. He also said the time to implement these solutions is now. “When you look at the war efforts in the past, and within only a matter of weeks all the factories in the United States converted to building tanks instead of cars and trucks,” said Potter. Potter said he will be back to support the climate strike next week. He is hoping that the numbers continue to grow.